The RORC Caribbean 600 has grown up to become a 'must do' offshore classic. Now celebrating its tenth anniversary, the 600-mile race around 11 Caribbean islands is on the bucket list of any serious offshore sailor. This year, any remanence of its stature as a Caribbean cruise was totally extinguished. 25 knots of solid trade winds with gusty squalls and a confused sea state delivered a challenge to over 800 sailors from six different continents. 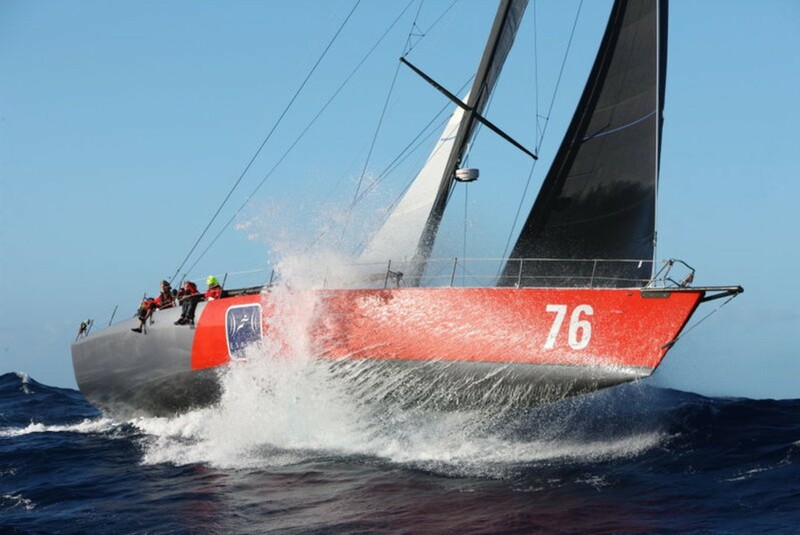 The 2018 edition of the race was the coming of age of the RORC Caribbean 600. The importance of the race to Antigua & Barbuda was recognised at the prize giving where guests of honour included: The Governor General Deputy, Sir Clair Roberts and his wife, The Hon E.P. Chet Greene, Minister for Sports; Shirlene Nibbs, Consultant to the Ministry of Tourism; Shamoy Richards, Cruise marketing manager for the Antigua & Barbuda Tourism Authority; Admiral of Antigua Yacht Club, Sir Hugh Bailey, and Commodore of Antigua Yacht Club, Franklyn Braithwaite GOH. The RORC Admiral, Andrew McIrvine, RORC Chief Executive, Eddie Warden Owen were both in attendance along with most of the RORC Committee. RORC Commodore Steven Anderson, who took part in the race with his family on board Gemervescence, was quick to praise the army of volunteers and the race committee for their hard work, as well as all the competitors - pointing out that the vast majority were passionate corinthians, the heart and soul of the Royal Ocean Racing Club. George David's American Maxi Rambler 88 scorched around the 600-mile track to set a new monohull course record of 37 hours 41 minutes and 45 seconds, beating the record set by David's previous boat, Rambler 100 in 2011. After setting the best corrected time under IRC, Rambler 88 remained unbeaten, winning the RORC Caribbean 600 Trophy. George David commented. "In 10 years the '600 has gone from a handful of boats in its first edition, to 84 on its tenth anniversary. It's a great race all around; congratulations to the RORC and everyone involved. We're delighted to have won overall in IRC and better yet to have broken our own record at the same time." Ron O'Hanley's American Cookson 50 Privateer came the closest to beating Rambler 88 for the overall win, finishing the race in just under 52 hours, but falling short of the best IRC corrected time by just over one hour. This was an excellent result for a 50 footer in what was regarded as a big boat race because of the epic weather conditions. Third place overall was shared by two boats - Stephen Murray's Volvo 70 Warrior and Jens Kellinghusen's German Ker 56 Varuna. Warrior's corrected time gave her third overall and Varuna was awarded time allowance for the assistance she gave in the successful rescue of Greg Slyngstad's Fujin crew after she capsized on the first night, and this equalled Warrior's corrected time. A special mention should go to the crew of Stephen Cucchiaro's Gunboat Flow, which also assisted in the rescue. The first boat around the 600 mile course was Peter Aschenbrenner's 63ft American trimaran Paradox which was in scintillating form, finishing the race in just 37 hours, 5 minutes and 16 seconds to take multihull line honours and beating Rambler 88 to the line. After MOCRA time correction, Paradox also claimed the overall win for the Multihull Class. "All-in-all, the conditions were just perfect for Paradox; she loved it," commented Peter Aschenbrenner. "This is what we dream about doing in the boat. The conditions we had in those big reaches was intense; the wave state was really big and there was a lot of wind. Eleven is a great fleet of multihulls and this is a great place to race them; you are going to be wet and it might as well be warm. It is a combination of great wind and great scenery, it is a wonderful course." Jason Carroll's American Gunboat 62 Elvis impressed in their first race, taking second in the Multihull Class. Gilles Lamire's French Multi50 French Tech Caraîbos, also competing for the first time, completed the multihull podium. The smallest yacht in the 84-boat fleet was Shaun Carroll's Australian modified Sea Cart 30 Morticia, which finished fourth. After three days and nights, Morticia crossed the finish line to a hero's welcome. Described by many as a beach cat, the crew lived off chocolate bars, got soaking wet, with virtually no sleep; it was an incredibly tough ordeal. Catherine Pourre's Eärendil took line honours for the eight-strong Class40 division in an elapsed time of 2 days 13 hours and 15 seconds, breaking the previous record set by Gonzalo Botin's Spanish Tales II in 2016 by over three hours. Eärendil, with a French, Spanish and Italian crew also won the Class40 division for this year's race by just under three hours. Louis Burton's BHB was second in class and Arnt Bruhns, racing his German Class40 Iskareen was third. John Niewenhous racing his American Class40 Loose Fish with Josh Hall was the only Two-Handed team to complete the race. "It is one of the fiercest and most challenging races for Class40 because of the number of manoeuvres, and this year because of the weather conditions," commented Catherine Pourre. "I hope we will have many more boats next year. There are 58 potential candidates for next year's Route du Rhum which will finish in Guadeloupe." Philippe Frantz's French NM43 Albator was the victor in IRC One; Lombard 46 Pata Negra, led by Michael Wright and a crew from Howth Yacht Club Ireland was second, with Kevin McLaughlin's American J/44 Spice was third. "This is my first RORC Caribbean 600 and it has been amazing," exclaimed Frantz. "It was unexpected to have this wind and sea; it was a tough race I can tell you. We are all smiling because we have finished the race and everybody is in good shape. Fun is one thing and safety is another. You feel like you deserve to finish! It will be a great memory for us. The difference was the team - they have been absolutely fantastic." In IRC Two, Ossie Stewart's British Dufour 45 Scarlet Island Girl (sailing with Ross Applebey) crossed the finish line after over three days and nights of hard racing to win the class. Andrew Allner's Swan 53 Ballytrim was second ahead of Susan Glenny's First 40 Olympia's Tigress, skippered by Chris Preston. That was just relentless," commented Olympic medallist Ossie Stewart. "Day and night we had strong conditions with really confused seas, but we never had wind and waves we couldn't handle. We lost the steering a couple of times, but Ross handled the problem superbly, fixing the issue whilst we steered with the emergency tiller. On a personal note, I am really proud to have finished and win the race with my son Cameron." "This was definitely a wet and wild ride," commented Conor Fogerty. "The last race I won was the OSTAR single-handed and I came down to do this race for therapy to get back into sailing, but after experiencing this event, it didn't feel like therapy! We had a fantastic welcome with about 20 people on the dock. Getting that respect just lifted us after a tough race." Andrew Eddy's Oyster 48 Gaia was the last boat home, completing the race with his daughter, son and young friends over three days after Rambler 88. "The crew never gave up, never mentioned the night club as we passed St.Barths, or the chance to visit the frigate bird colony of Barbuda. We came here to finish the race and that is exactly what we have done!" commented Andrew Eddy. Did Gaia get a welcome? Of course, this is the RORC Caribbean 600.